One thing we already know is that we all love Pinterest. It is a site we can get sucked into and before you know it hours have passed and your day is gone. It is a great way to spend some relaxing time on the weekend and a great source of inspiration for any project you may have in mind. As fun as it is to pin anything and everything you think looks gorgeous, delicious to eat, or you swear you will DIY this one this time, there is an art to using Pinterest correctly and making it work as best it can for your business. We are the first to admit we need to revamp our page, as it started as a personal page for fun and then morphed into our business page. There is a lot that goes into making your Pinterest page work for your business and it is not something we can just update overnight as we have thousands of pins to reorganize and make work for us. So over the next few weeks we will be converting our page to an actual business page and start reorganizing all our pins so you can find what you are looking for a lot easier. Here are some tips we are using to improve our page and want to share with you so you can improve your pages too! Optimize your Business name and About section and make sure that if you are a business you have a business page so you can see the analytics. Use your space wisely and make sure you have a clear and relevant business description to take advantage of the search engine and make sure people will find you when they search for what it is your business does. In addition to your business name and about page each of your boards is a way to be found in the search results. Make sure to use key words in your board names and in the descriptions of your boards. Make sure your pins actually link back to relevant content! No one wants a pin that does not go anywhere. We know we are guilty of repining things that look great and then looking it up later only to find the link doesn’t go anywhere. Clean up your pins and make sure they all link to something and from now on make sure to check pins before you repin. Make sure your pins are relevant to your business. Use a few of your boards to actually showcase your business or your products and get your name out there more. While this is a great way to promote what you are doing make sure to have other boards as well that are not just your products or your business. Make sure it isn’t a page that just says look at me, share other great things and showcase other great business owners with your pins. Consistently pin to your boards. Even a few pins each day makes a difference and makes sure to get your name out there in front of your audience on a regular basis. To reach even more people vary the time you pin so your pins show up in front of different people to help gain a larger audience. Share different types of content as well. Pin images, video, audio, slideshows, etc. The more different types of media you use the more your page will get noticed and the more interesting it will be which will get you more traffic. Join group pin boards or make one yourself and invite some of your favorite people to pin to it. This is a great way to get in front of other peoples Pinterest followers and hopefully gain a few more followers of your own. Make your website pin friendly. Make sure to add the Pin it button to your images to make it easy for people to pin from your page. You will also want to make sure to have the correct description in the Alt Tag for your image as that will pop into the description of your pin. Always save images with a relevant name so it shows up in searches. Do not just use the default number your camera saved it as. 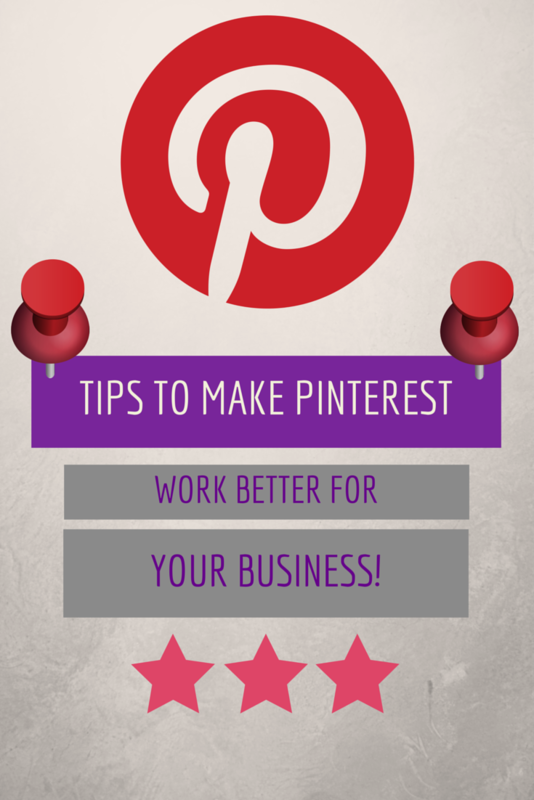 Use these tips and before you know it Pinterest will be successfully working for your business. Head on over to our Pinterest Page and give us a follow to see what we are up to! « We Updated our Twitter & Instagram Pages! Take a look!